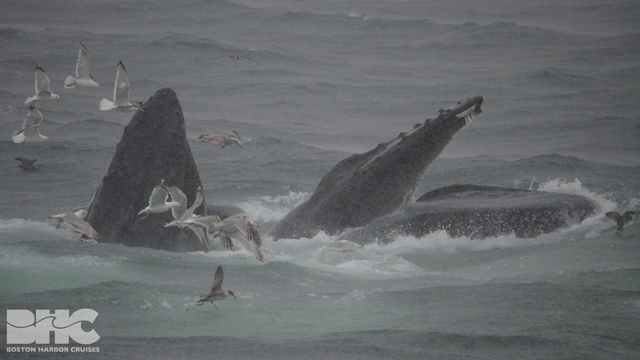 We had quite the wet and wild whale watch this morning on the Sanctuary with Captain Adam! We cruised through quite the downpour as we made our way offshore. 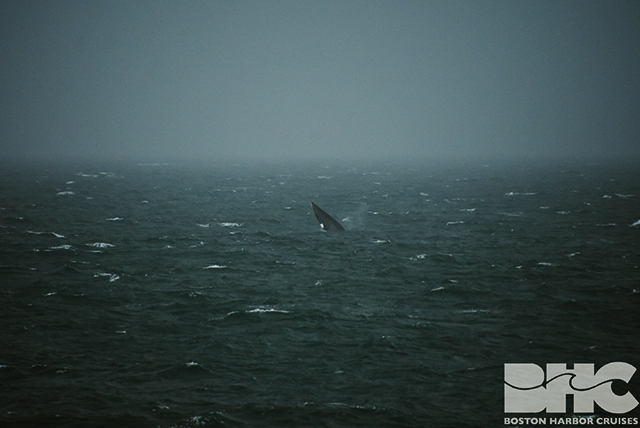 Around midbank, we came across a solo humpback named Tinder bubble cloud feeding lower in the water column. After watching Tinder for a good while, Captain Adam decided that we should take a chance, and he led us further east. 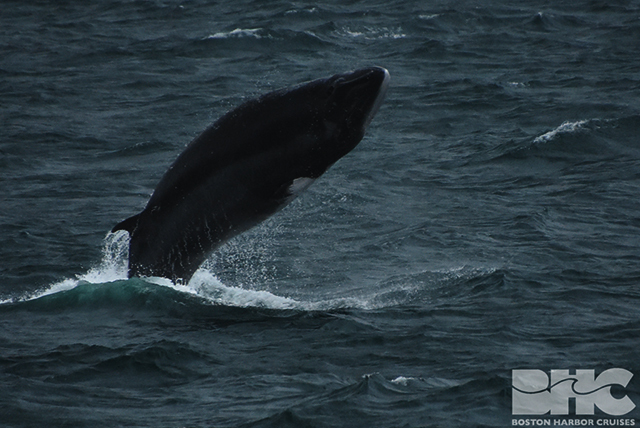 Despite worsening weather conditions, we were rewarded with breaching and consistent bubble net feeding! 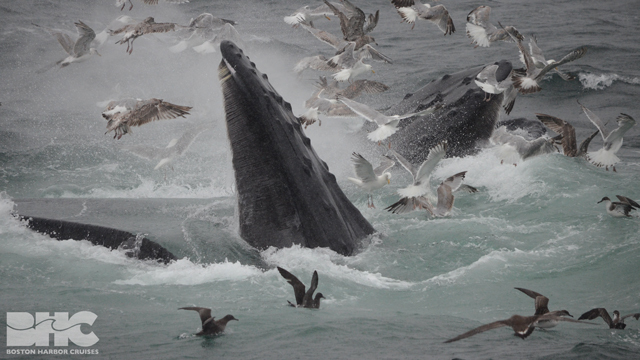 Time after time, Fulcrum and Cantilever lunged out of the water and into the rain with giant open mouths of fish. 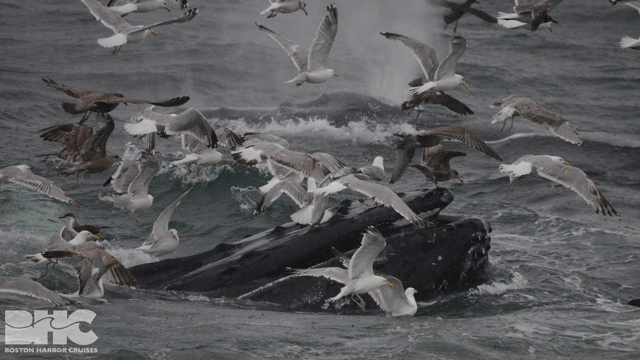 Three times we were surprised by Fulcrum, a large, female humpback whale, as she surged high up out of the water with incredible power and a giant splash. 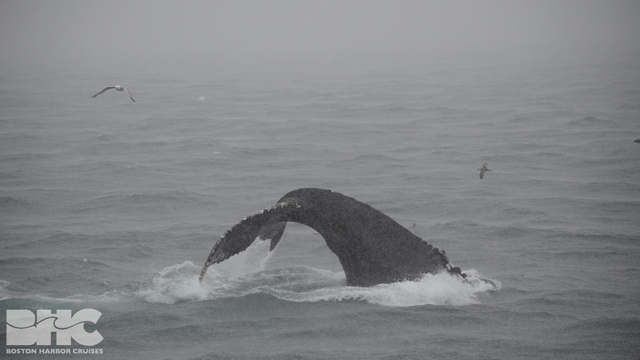 On the way home, I was pleased to hear from the soaking wet, but happy, passengers that the excitement of the whale watch was well worth the trek through the rain! 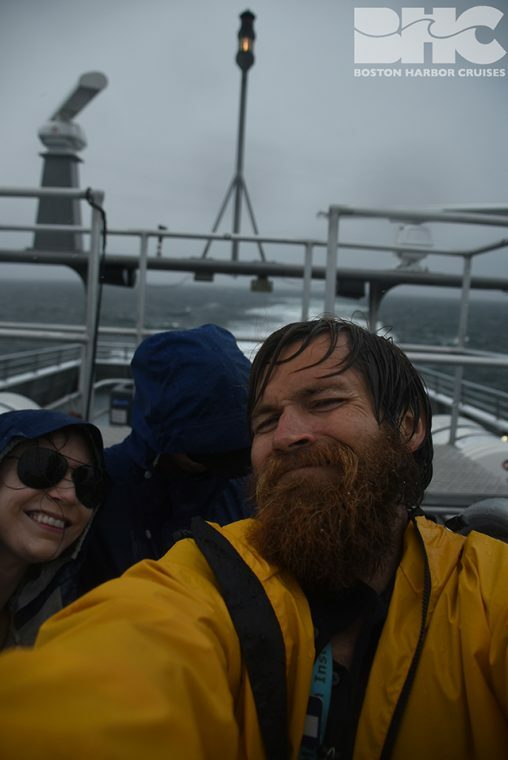 While the rain had subsided by the time we made it out on our afternoon whale watch with Captain Dave, sea conditions had worsened, making for a very bumpy ride. 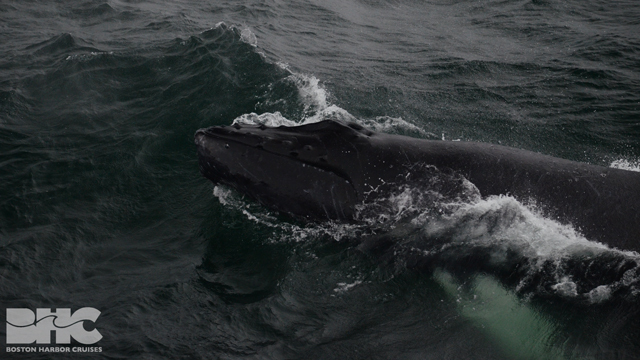 But, low and behold, the whales of Stellwagen Bank once again made our troubles well worth it! 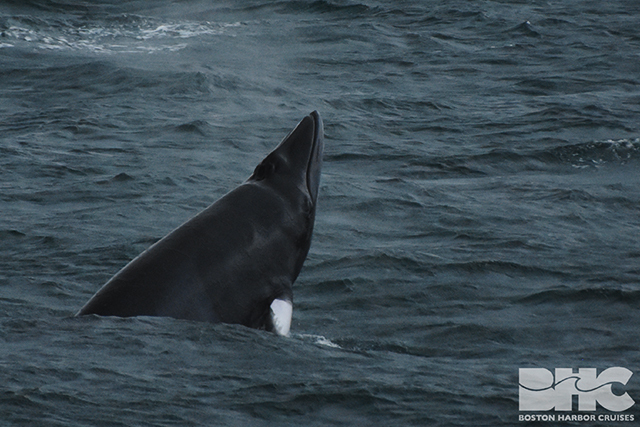 On the northwest corner of the bank, we found at least a half dozen of each baleen species (humpbacks, fins, and minkes)! 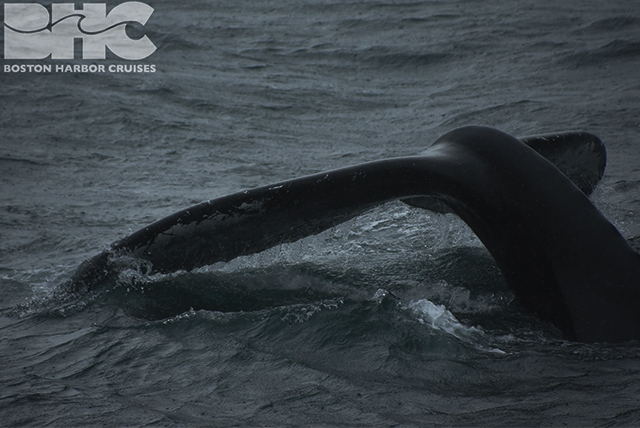 We were surrounded by these giants on all sides throughout the entirety of the whale watch, making narration challenging but exciting! I hope that by the end of the trip most of our guests understood our directional clock system for pointing out whales, because that’s pretty much all I was able to fit in! 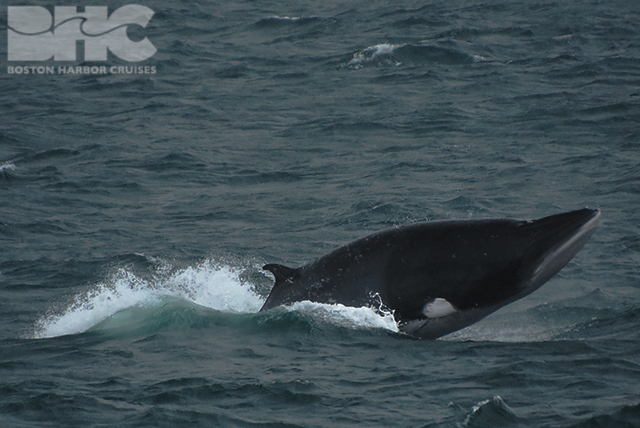 While humpbacks breached and fed, calves spy hopped, minke whales darted to and fro, and enormous fin whales unabashedly cruised right by the boat in groups of up to four animals!!! 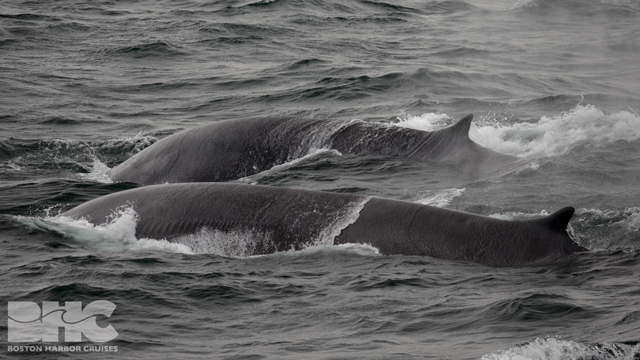 While it isn’t unusual to see fin whales traveling in pairs, they are rarely seen in groups of three and almost never (from my experience) seen in quartets! 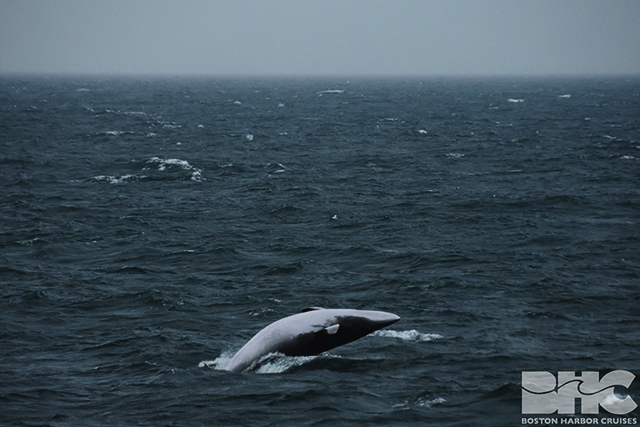 A first time sighting for me, this group of four fin whales made our afternoon whale watch one I will never forget!